Please help accumulate bookmarks to user-support knowledgebases in whatever forms they exist? Giacomino - giavec@zotum.net. More like this are needed. I've installed the Diaspora, ActivityPub and GNU-Social apps. How do I use them to access other fediverse services (e.g. mastodon)? Are there any directories of fediverse accounts, organised by topic? Or forums or message boards? I'm having trouble actually finding any content. OK, thanks. It looks like there just isn't much content yet. in truth, despite the fantastic software, and a cutting-edge communication protocol, there are few active people who use hubzilla, few compared to mastodon to give an example, but, moreover, people do not look at some beautiful and particular beaches but they are looking for fashionable beaches. It doesn't matter if few people are using hubzilla and many are using mastodon, since you can still interact with those using mastodon. Isn't that the point? you can use for ex. the Find Channels in /directory with a word ( interest) and find all the channels that like that 'interest' in hz. Oh. So how do you find them then? Do they have their own directories? every software works differently, but from what I know, the other networks, their developers, have no interest in creating a general directory, while someone from hz had already proposed something like that. @ChannelName Mastodon (ActivityPub) offers an optional directory. It can be activated by the server. Users have to opt-in to get listed. Lastly, it's on a per-server basis. They don't have a "universal" Mastodon directory. Pleroma (ActivityPub) doesn't have any user directory. ActivityPub itself, like, the whole network, doesn't have a "universal" directory and I don't think it's part of the specification. @Max Similar to the user directory, hashtag following is not part of the ActivityPub specification (if I remember correctly). Hence even in other ActivityPub-based platforms, they do not offer hashtag following or directories. Compare that to The Federation specification, hashtag following is part of its spec so Hubzilla (and Friendica) have the same feature. On the other hand, Hubzilla , Zap, and Osada (and Friendica too) have a user/channel directory (I think it's more of "discovery"). Bottomline, it's all about the specs. If it isn't part of it, there would be a thousand possible implementations of something which may or may not put load on other servers too. The devs of different platforms has to agree on how to implement something that is not covered by the specs, and devs of different platforms seldom agrees, or let's say, it all comes down to the "majority" (*cough*ActivityPub*cough*). While hashtag following and user directories are good features, since these are not part of the ActivityPub spec, it will heavily rely on what each lead devs and dev teams of each different platform with different objectives and practices will agree on how to implement these features. For example, Mastodon prefers a per-server directory not a "universal directory". Which is doable in the Zot6 and Zot specs but probably not in ActivityPub. I could be wrong, don't take my word for it. But it's generally has to do with what's in the specs and what is not. What do you mean by "The Federation specification"? My understanding was that there are various communication protocols (e.g. 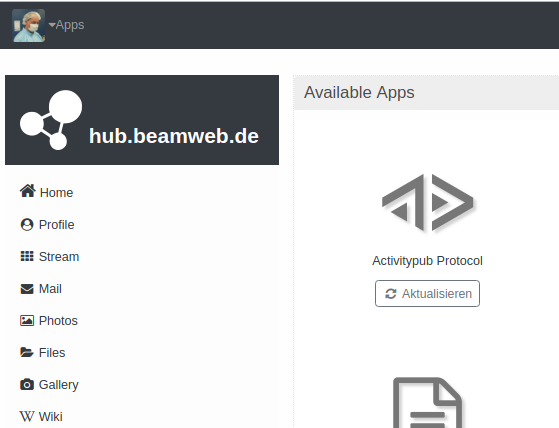 ActivityPub), and "The Federation" is just the name given to the collection of servers which communicate using them. Yuki: do you think the hahstag following part of the Diaspora* protocol (the Federation specification) could be adapted to #activitypub? Or is it too different? As an example I have connected to my diaspora* account and I get that problem too (mutually added myself). I just want to know what that icon means, how is it named to be able to do web search about it and try to solve connectivity issues. My channel settings are "default" (FTR) and "Social - mostly public"
So, as far as adding contacts to other networks is concerned, you must first install the apps, such as the diaspora app, in the list of available apps. if in the list of available you do not meet, then it means that admin has not enabled and you have to ask him. means that the other person has not yet accepted your friendship. but in the case of a hubzilla- forum it should be automatic, and if you see that signal, try again after a few minutes/hours and see if everything is ok. The problem IS that I can not figure out WHY diferent users with the same protocol have diferent settings. I have to dig on this issue reading hubzilla help guides. so you already have installed ( at user level) activitypub app and diaspora app , right? If that checkmark means the other people have to accept my following request then there's some bug or problem because (at least) one pleroma user didnt see me on the followers list and have no pending requests. With this one in particular I can read their posts from here (hubzilla) but I can not like/comment. Thanks for your time, I guess this things happen with software under development like all this fediverse servers. "one pleroma user didnt see me on the followers list and have no pending requests"
in these cases, if with other contacts mastodon/pleroma you do not have this type of problem, it can mean a problem in that specific site of pleroma, and they have to activate and read the logs to understand where it is blocked. I'm considering the possibility of running a tabletop role-playing game using Hubzilla as a platform. 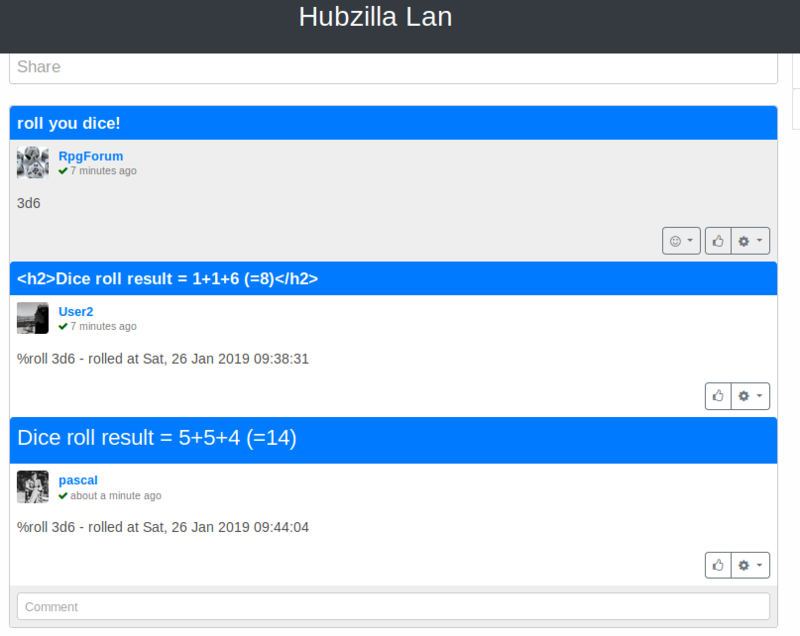 Hubzilla has some nice features for this, like forum channels, and a built-in wiki. The only thing I can see that's missing is an easy, transparent way to roll dice. While I could just use the honor system, I'd like to have something more reliable than that. I would imagine the best way to implement this would be some simple add-on script with its own markup commands. Something like, "%roll 3d6". Ideally, the dice results wouldn't be editable (forum-side? ), but even that wouldn't really be strictly necessary, at least for my own games. Alternately, perhaps a bot could respond when called. That might make it easier to keep the results from being altered. This shouldn't be too hard to code, right? I would suggest doing just a little hacking on the chat application to add come method of commands. Or, if you can find a PHP application on github or elsewhere, depending on how complicated the existing app is, it may easily be able to be turned into an Hubzilla ADDON. @M. Dent I don't know PHP. I can write a simple offline script in Python, but even then, I don't know how I would integrate it into any web platform. Maybe you could share a mock-up of your game and / or show us what you have currently & where you are blocked? @Pascal I'm thinking of just a basic play-by-post game, using a forum channel as the platform. Players can post their character sheets, the GM can make posts to set new scenes, with images for maps and such, which can be played out in comments. Some sort of informal markup (((like so))) can be used for short OOC comments and questions, while anyone can make a post for longer OOC questions and discussions. The OOC markup doesn't need any sort of technical implementation, just something to show that it's distinct from IC. The only thing left that's really necessary is some way to handle dice rolls. The honor system could work, where each player can simply roll their physical dice and just report what the results are, but that has no accountability for suspiciously long lucky streaks, like the player who just happened to roll five natural 20's in a row. That's where some sort of built-in or add-on dice roller function, as described above, would come in handy. Everything else would be bells and whistles. Hubzilla's decentralized design would, theoretically, allow a wider potential pool of players and games. The built-in wiki can be used as a campaign journal. Presumably, other existing features can be used in ways I haven't bothered to think of. Really, the dice roller is the only catch to getting something like this up and running. I took your question as an exercise in hz add-on creation and created a simple prototype - tell me if you like it. @Pascal Beautiful, I love it! Since you've got it generating the timestamp in the body of the post, how hard would it be to get the result generated in the body, as well? If so, would this allow it to work in comments, as well? Right now, I'm thinking about rolling for initiative, where every player needs to make a roll in order to start combat. Actually, come to think of it, combat is pretty dice-heavy for most systems, which would make it that much more useful to have it work in comments. I love that you included the individual rolls as well as the sum total in the result! That should be useful for systems where you need to know one or more individual rolls. What comes to mind is the D6 system, which uses a "wild die" that gives a bonus if you roll a 6, and, optionally, a penalty if you roll a 1. Comments also can have titles, there's just no UI to do it. So, it should actually work in comments already.. Yes, just a hint: If you edit a comment you can add a title. It does work and using scripts you will surely be able to do it on posting a comment, as @M. Dent said. Since you've got it generating the timestamp in the body of the post, how hard would it be to get the result generated in the body, as well? If so, would this allow it to work in comments, as well? I propose that I clean up what I did and publish it as a first version. For additional features / modifications, I propose that they are created as issues in framagit, so anyone interested to help you could do it and the changes are reviewed. As you seem to be very much into table-top gaming, consider the generic use case(s) and describe them as well as you can in those issues (1 issue per use case); if you can, illustrate them by mock-up pictures (not everybody is so well into this topic as you are). Question to experienced devs: is this something to add to hzaddons or should I create a seperate addon repo? It would be best if someone peer reviewed my contribution. Ah ha! That's perfect! I can't think of anything else I would add to that. Thank you so much! @Blechpirat that could just be handled as three-sided dice, couldn't it? 1 is a minus, 3 is a plus. Yes, but you add them up. And that is a bit of work if you use d3, because you need to translate every dice. For example, if I roll -,-,_,+ (which would be -1) with d3 I get 1,1,2,3 (total of 7) - translating that every time you roll isn't that much fun. 4d3-8 should work, but the bot can't do that? thanks for the enthousiasm... however hold your horses - the fudge dice thing is possible to implement but let me just finish the add-on first as it is. So I created the add-on in my own add-on repo. * Your profile pic -> drop-down "Admin" -> "Addons"
Awesome! Now to get my hub admin to add this to the hub! Diceroller 0.2 supports the Fudge game type. Just update as I indicated above, it should work. Hope this will introduce some more folks to Hubzilla. This is awesome, just updating. 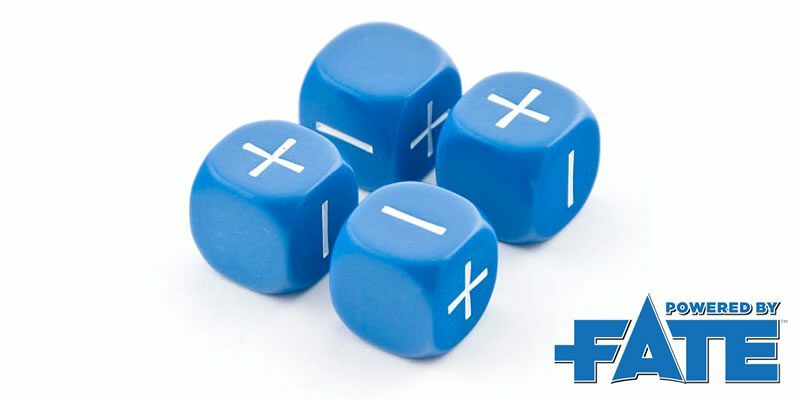 Command ist %roll 4dF? Please update to diceroller 0.3 to enjoy anti-cheat feature that users cannot edit/delete their post after making a roll. This feature was broken in version 0.2. @Pascal that is freaking awesome! You're doing the work of the Dice Gods, my friend! Thanks for the encouraging words; however 90% of the kudos must go to the people that maintain HZ for the common good because it would not be possible (or not as easy) without them. you know that you can pin the apps that you like more in the navbar? How can you tell if an instance is dead? How long should I give it to come back? i've seen a server go offline for days and then come back (tiksi.net). what server are you talking about? tiksi.net admin is @Max Kostikov, far as i know. the last post from him is from 17 hrs ago. seems to be busy -- with the server or real life. wait it out, is my advise. Yeah, I dropped him a note this afternoon. No biggie. i'm pretty sure tiksi net is not portable. fishing is a possiblity of course. the hubmin lives in russia, so ice fishing. ?? I'm not sure what you mean. Haven't clue whats up there but at this moment it looks like hardware issue. Support now working over it. @tiksi@net use my own dedicated server with drives mirroring and backups. Anyway nothing should be lost.  @tiksi@net вернулся онлайн после нескольких часов недоступности вызванных отказом оборудования вследствие DDOS атаки на один из пограничных роутеров.  @tiksi@net is back online after several hours of unavailability. This happened because of hardware failure due DDOS attack on one of border gateway routers. How are nomadic clones affected (if at all) if the primary account goes offline (like mine has)? I notice my ident still points to my primary account and I'm now getting errors about missing comments. if you later discover that it is definitely dead, then you enter in /locs and act accordingly. Don't know if dead. Has been offline all day. Waiting to hear back from the admin. I'm getting lots of errors because older posts are still going to the dead host. in theory you should not have any problems with the comments and posts of your contacts, you should receive everything in your clone without problems. Yeah, these are diaspora contacts mostly. To further complicate things, the dead server was pre zot6, the one I'm on now is running the rc branch. Zot based services will remain relatively unaffected. The possibility of a couple of unresolvable links for images, etc. exists, but ZOT based communications will be unaffected. Once it comes back - things should resynchronize relatively quickly. For non-zot protocols - that's a whole different story. As @Giacomino said, whatever the protocol rules for that particular protocol is probably a good guideline. Sorry, what I meant was the stable server parsed (?) diaspora protocols correctly. Zot6 does not. Hello, I'm new here. After I add some friends who are using Mastodon, their 'pure reply' (start with a '@", when they are replying a tweet on Mastodon) will show on my network stream, which won't happen when I add them on a Mastodon or Friendica instance. Is there any way I can hide those 'pure reply' on my network stream? Thank you and sorry for my poor English. is it possible to view the channel, network or pubstream as RSS Feed? i searched for it but find no infos about this. The channel feed is available at https://yoursite/feed/nickname. There are no feeds currently for the network stream (it"s a private resource and would require authentication). There probably could be a feed for the public stream but nobody has implemented it yet. No worries. I didn't even notice.